Symbol for Swale main channel (with underdrain) used in the MIDS calculator. Schematic of Watershed tab for Swale main channel (with underdrain). The user must input a value for impervious area or the BMP will not provide volume and pollutant reduction. Other fields are optional. 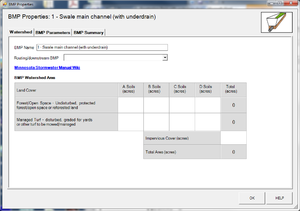 Schematic of BMP parameters tab for Swale main channel (with underdrain). The user must enter values for all blank cells. Caution: The swale main channel with an underdrain assumes there is a bioretention base (engineered media). See the section on filter media for more information. A swale main channel with an underdrain behaves similarly to a bioretention BMP with an underdrain. If the underdrain is not elevated above the native soils, then most of the stormwater captured by the BMP is lost to the underdrain, with some volume reduction achieved through infiltration below the underdrain. Volume retention also occurs by evapotranspiration (ET) through the vegetation in the swale. For systems with an elevated underdrain, volume retention is achieved through infiltration of water stored in the pore spaces of engineered media between the invert of an elevated underdrain and the native soils. If runoff to the main channel flows over a side slope through sheet flow, then a swale side slope BMP should be used in combination with the swale main channel BMP in the MIDS calculator. All pollutants in the infiltrated water are credited as being reduced. A portion of pollutants in the stormwater that flows through an underdrain is removed through filtration. 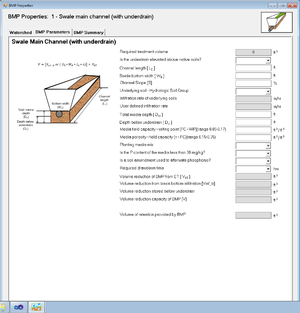 For a swale main channel with underdrain system, the user must input the following parameters to calculate the volume and pollutant load reductions associated with the BMP. Routing/downstream BMP: if this BMP is part of a treatment train and water is being routed from this BMP to another BMP, the user selects the name of the BMP to which water is being routed from the dropdown box. All water must be routed to a single downstream BMP. Note that the user must include the BMP receiving the routed water in the Schematic tab or the BMP will not appear in the dropdown box. BMP Watershed Area: BMP watershed areas are the areas draining directly to the BMP. Values can be added for four soil types (Hydrologic Soil Groups (HSG) A, B, C, D) and for three Land Cover types (Forest/Open Space, Managed Turf and Impervious). The surface area of the BMP should be included as managed turf land cover of the hydrologic soil type of the native soils that are located under the BMP. Units are in acres. If a swale side slope is routed to this BMP, do not include the side slope watershed areas in the Watershed tab for the swale main channel since this would effectively double-count the side slope contributing area. Is the underdrain elevated above native soils? : This is a YES/NO question. Answering YES means that the underdrain is elevated within the media such that storage capacity exists between the level of the underdrain and that of the native soils. Answering NO means that the underdrain is not elevated within the media and is directly above the native soils, with no associated storage capacity. Channel length (LC): This is the length of the swale channel from the furthest upstream point to the furthest downstream point. Units are in feet. Swale bottom width (WB): This is the average bottom width of the swale main channel. Units are in feet. Based on design restrictions, the bottom width cannot be less than 2 feet. Channel slope (S): This is the slope of the channel. Units are in percent. The slope is calculated by taking the difference between vertical elevations at the upstream and downstream points of the swale and dividing by the horizontal distance between the two locations. The slope therefore represents an average slope over the length of the swale. If the slope varies over the length of a swale, the user should enter the average slope over the entire length rather than break the swale into separate smaller lengths. Based on design restrictions, the channel slope cannot be less than 0.5 percent or greater than 4 percent. Total media depth (DM): This the total depth of the bioretention base from the surface of the engineered media to that of the native soils. Units are in feet. Depth below underdrain (DU): This is the depth of the bioretention base from the elevation of the underdrain invert to that of the native soils. If the input to “Is the underdrain elevated above native soils” is set to NO, then this value will default to 0 and will become inactive. Units are in feet. Media field capacity minus wilting point (FC-WP): This is the amount of water between field capacity and the permanent wilting point stored in the media above the underdrain. This is water often considered to be available for uptake by plants. If multiple types of media are used in the BMP, this value should be a weighted average of the soil water storage values of the media installed above the underdrain. Units are in cubic feet of water per cubic feet of media. The recommended range for this value is 0.05 to 0.17. 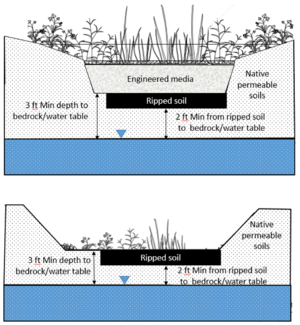 Media porosity minus field capacity (n - FC) - This is the amount of water between media porosity and field capacity stored between the underdrain invert and the bottom of the media (top of native soil). If multiple types of media are used in the BMP, this value should be a weighted average of the soil water storage values of the media installed between the underdrain and the native soils. Units are in cubic feet of pore space per cubic feet of media. The recommended range for this value is 0.15 to 0.35. Planting media mix: The user selects the type of media mix installed for planting from a predefined list of Media mixes: Media mix A (water quality blend), Media mix B (enhanced filtration blend), Media mix C (North Carolina State University water quality blend), Media mix D, or Other. This value is used to determine the annual phosphorus load reduction credit. Is the P content of the media less than 30 mg/kg? : This is a YES/NO question. The P content of the planting media should be tested using the Mehlich 3 test or an acceptable alternative method. Select YES if the P content of the planting media is less than 30 milligrams per kilogram and NO if it is greater. P content testing is not needed for planting media C or D; therefore, this item will automatically populate to YES if one of those two media types are selected. This value is used to determine the annual phosphorus load reduction credit. Is a soil amendment used to attenuate phosphorus? : This is a YES/NO question. Answer YES if the bioretention filter media contains soil amendments to enhance phosphorus sorption and NO if amendments are not used. This value is used to determine the annual phosphorus load reduction credit. Underlying soil - Hydrologic Soil Group: The user selects the most restrictive soil (lowest hydraulic conductivity) occurring within the 5 feet below the media/native soil interface of the swale main channel. There are 14 soil options that fall into 4 different Hydrologic Soil Groups (Hydrologic Soil Group (HSG) A, B, C, or D) for the user. Once a soil type is selected, the corresponding infiltration rate will populate the Infiltration rate of underlying soils field. The user may also select User Defined. This selection will activate the User Defined Infiltration Rate cell, allowing the user to enter a different value from those in the predefined selection list. The maximum allowable infiltration rate is 1.63 inches per hour. Required drawdown time: This is the time in which the stormwater captured by and ponded within this BMP must drain into the underlying soil and/or flow through the underdrain. The user may select from predefined values of 48 or 24 hours. The MPCA Construction Stormwater General Permit requires drawdown within 48 hours, but 24 hours is Highly Recommended when discharges are to a trout stream. The calculator uses the underlying soil infiltration rate and the Depth below underdrain (DU) to check if the BMP meets the drawdown time requirement. The user will encounter an error and be required to enter a new Depth below underdrain (DU) if the water stored in the BMP cannot drawdown in the required time. BMP Summary Tab: The BMP Summary tab summarizes the volume and pollutant reductions provided by the specific BMP. It details the performance goal volume reductions and annual average volume, dissolved P, particulate P, and TSS load reductions. Included in the summary are the total volume and pollutant loads received by the BMP from its direct watershed, from upstream BMPs, and a combined value of the two. Also included in the summary are the volume and pollutant load reductions provided by the BMP, along with the volume and pollutant loads that exit the BMP through the outflow. This outflow load and volume is what is routed to the downstream BMP, if one is defined in the Watershed tab. Finally, percent reductions are provided for the percent of the performance goal achieved, percent annual runoff volume retained, total percent annual particulate phosphorus reduction, total percent annual dissolved phosphorus reduction, total percent annual TP reduction, and total percent annual TSS reduction. If the following requirements for inputs into the MIDS calculator are not met, then an error message will inform the user to change the input to meet the requirement. If DDTcalc is greater than the user-specified required drawdown time then the user will be prompted to enter a new depth below the underdrain or infiltration rate of the native soils. The total estimated Volume reduction capacity of BMP [V] is the sum of infiltration and ET occurring in the swale main channel with underdrain, and is calculated with user-provided inputs. For this BMP, the location of the underdrain determines how the infiltration component is calculated. If the underdrain is located at the bottom of the BMP, then the infiltration credit is based on infiltration into the bottom of the BMP (Vinfb). In contrast, if the underdrain is elevated above the bottom of the BMP, then the infiltration credit is based on the volume capacity of the bioretention base (VBB) between the underdrain and the native soils. Both types of underdrain configurations can receive credit for ET in the media above the underdrain (VET). The Volume of retention provided by BMP is the total instantaneous volume credit that can be claimed for that BMP, and is determined by comparing the Volume reduction capacity of BMP [V] to the Required treatment volume. LC is the channel length (ft). The default infiltration rate is set at 0.06 inches per hour to represent a D soil. This rate was selected because it is assumed that most of the stormwater will pass through the underdrain before it can infiltrate through the bottom of the BMP. This may be a conservative assumption if underdrains are small, spaced far apart, and the underlying soil has an infiltration rate greater than 0.06 inches per hour. Conversely, more closely spaced or larger underdrains may allow the basin to drain in less than the required drawdown time, resulting in a slight overestimation of (Vinfb). 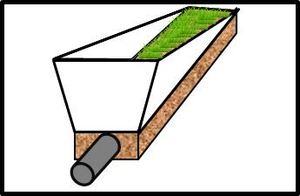 If the user specifies that an impermeable liner is present at the bottom of the BMP, then no credit is given for infiltration into the bottom soils. (n-FC) is the media porosity minus the field capacity. The stored water must drain within the specified drawdown time. The underlying soil controls the infiltration rate. The user must input the soil with the most restrictive hydraulic conductivity in the 5 feet directly below the basin (i.e. below the bottom of the engineered media). In addition to the credit given for the infiltration, a swale main channel with an underdrain can achieve volume reduction through ET. The Volume reduction of BMP from ET (VET) as determined by the MIDS calculator is the smaller of two calculated values, potential ET (ETpot) and measured ET (ETmea). (FC – WP) is the difference between field capacity and wilting point. Measured ET (ETmea) is the amount of water lost to ET as measured using available data. An average daily pan evaporation rate was estimated using previous measurements collected at the University of Minnesota Southwest Experiment Station at Lamberton, Minnesota (Source: Climate of Minnesota Part XII- The Hydrologic Cycle and Soil Water, 1979). A rate of 0.2 inches per day was selected, as this is an intermediate value between the summertime maximum rate and the lowest rates in October. Analysis of rainfall data indicates that a typical time period between precipitation events is 72 hours (3 days) in Minnesota. Therefore, a 3 day period is used to calculate the ETmea. A factor of 0.5 is also applied to convert the pan evaporation rate to ETmea. The ETmea volume thus equals the media surface area (LC * WB) in square feet times the average daily ET rate in inches per day times 3 days. The sum of the volumes lost to infiltration and to ET as calculated using the appropriate methods above gives the Volume reduction capacity of BMP [V]. The MIDS calculator compares the Volume reduction capacity of BMP [V] with the Required treatment volume, and the lesser of the two values is used to populate the Volume of retention provided by BMP. This comparison between potential and actual treatment volumes ensures that the BMP does not claim more credit than is due based on the actual amount of water routed to it. The Volume of retention provided by BMP is the actual volume credit the BMP receives toward the instantaneous performance goal. For example, if the BMP is oversized the user will only receive volume credit for the Required treatment volume routed to the BMP. Annual volume retention is assessed by converting the instantaneous Volume reduction capacity of BMP [V] to an annual volume reduction percentage. This is accomplished through the use of performance curves developed from a range of modeling scenarios. These performance curves use the Volume reduction capacity of BMP [V], the infiltration rate of the underlying soils, the percent imperviousness of the contributing watershed area, and the size of the contributing watershed to calculate the Percent annual runoff volume retained. Schematic of pollutant removal mechanisms for a Swale main channel (with underdrain). Pollutant removal can be accomplished both via volume reducing and non-volume reducing processes in this BMP. Pollutant load reductions are calculated on an annual basis and are thus dependent upon the volume of water retained by the BMP through infiltration and ET and the volume of water treated by filtration in the BMP. The first step in calculating annual pollutant load reductions is to determine the Annual retention volume provided by BMP as discussed in the Volume reduction section. All pollutants in this retained water are considered captured for a 100 percent removal. Thus, while oversizing a BMP above the Required treatment volume will not provide additional credit towards the instantaneous volume performance goal, it may provide additional annual pollutant reduction through treatment of water beyond the Required treatment volume. Stormwater that is routed to the BMP but not infiltrated or lost through ET is assumed to flow through the filter media and out the underdrain, and is indicated by the Annual outflow volume in the BMP Summary tab. The removal rate for TSS in this filtered stormwater is set at 68 percent. 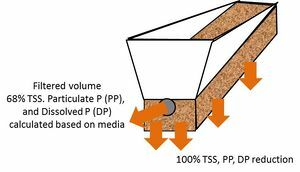 The removal rates for particulate phosphorus and dissolved phosphorus in the filtered stormwater depend on the user's input to three drop-down boxes: “Planting media mix”; “Is the P content of the media less than 30 mg/kg?”; and “Is a soil amendment used to attenuate phosphorus?”. The particulate phosphorus credit given for non-volume reduction treatment is either 0 percent or 45 percent depending on the media mix used and its P content. If Media Mix C or D is used, or if a media mix other than C or D is used and the soil phosphorus as measured using the Mehlich 3 test or a suitable alternative test is 30 milligrams per kilogram or less, then the annual particulate phosphorus reduction credit is 45 percent of the filtered water volume. If a media mix other than C or D is used and the soil phosphorus has not been determined or is greater than 30 milligrams per kilogram as measured using the Mehlich 3 test or a suitable alternative test, then the annual particulate phosphorus reduction credit is 0 percent of the filtered water volume. NOTE: If the Olsen test is used to determine P content of the media mix, a simple conversion is required. The dissolved phosphorus credit given for non-volume reduction treatment is between 0 percent and 60 percent depending on the media mix, the media P content, and if the media was amended to attenuate phosphorus. where (DM - DU) represents the media depth above the underdrain (ft). The credit is calculated as a percent reduction with a maximum value of 20 percent for media depths above the underdrain greater than 2 feet. If the media depth above the underdrain is less than 2 feet the credit is reduced equivalently. If a media mix other than C or D is used and the soil phosphorus has not been determined or is greater than 30 milligrams per kilogram as measured using the Mehlich 3 test or a suitable alternative test, then the annual dissolved phosphorus credit is 0 percent of the filtered water volume. For other proposed phosphorus-sorbing amendments: an additional annual dissolved phosphorus credit can be applied if and only if there is supporting third party research showing that this dissolved phosphorus reduction will occur for at least a 20-year lifespan. The credit may be commensurate with existing research results, with the understanding that the user may be asked to provide this documentation. Annual removal rates of particulate phosphorus and dissolved phosphorus in filtered stormwater are summarized in the following table. Overflow from a swale main channel with an underdrain can be routed to any other BMP except for a green roof, a swale side slope, or any BMP in a stormwater treatment sequence that would cause stormwater to be rerouted back to the swale main channel already in that sequence. All BMPs can be routed to the swale main channel with an underdrain. The following general assumption applies in calculating the credits for a swale main channel with an underdrain. If this assumption is not followed the volume and pollutant reduction credits cannot be applied. The swale main channel has been properly designed, constructed and will be properly maintained according to specifications for filtration systems. Information on operation and maintenance of filtration BMPs.